The ship H.M.A.S. Whyalla commemorates the first ship built in the town. Between February and April 1987, Whyalla was slowly moved up the slipway from which she was launched in 1941, and then relocated two kilometres inland and placed on permanent foundations, becoming the centrepiece for the Whyalla Maritime Museum which was officially opened on 29 October 1988. H.M.A.S. 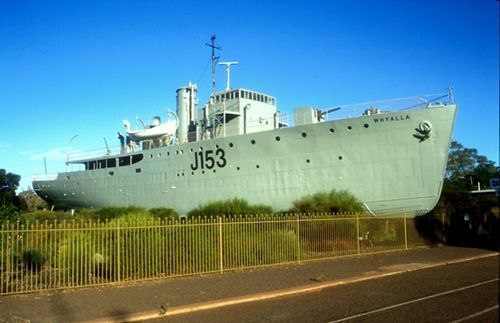 Whyalla was one of sixty Australian Minesweepers (commonly known as corvettes) built during World War Two in Australian shipyards as part of the Commonwealth Government’s wartime shipbuilding programme. Twenty ships (including Whyalla) were built on Admiralty order but manned and commissioned by the Royal Australian Navy. Thirty-six were built for the Royal Australian Navy and four for the Royal Indian Navy.